The quote I NEEDED today. Wait!?!?! Friggin Giuliani is a Sox fan???? Rudi sporting the sox hat!! YEAH I like that!!! :) Great quote! @snail - Rudy temporarily "converted" while he was stumping for primary votes in New England in 2007 after the Yankees were eliminated and he wanted the Red Sox nation on the "Rudy for President" bandwagon. Alas, no ticker tape parade for Rudy on that endeavor. 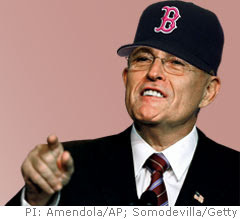 Never thought I'd see Giuliani in a Sox cap (even photo-shopped), but then again I never should have seen Torre in a Dodgers cap.